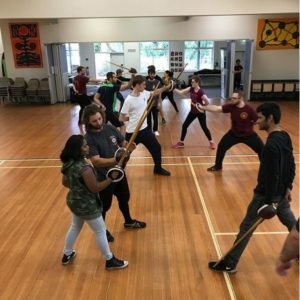 The Victorian Historical Combat Academy is the only HEMA club in Bayside Melbourne and focusses on teaching and practising 19th-century Italian military sabre fencing. Italian military sabre fencing is one of the preeminent sword martial art systems upon which modern fencing is based. It is a fun way to learn about sword fighting and history, while also improving fitness and having the opportunity to meet new people in a supportive and very friendly environment. The club has trained professional actors and an article about us in the Herald Sun newspaper can be found here. New members are always welcome, and it is easy and free to try – training is Wednesday nights at Moorabbin Primary School. Contact us at vhcahema@gmail.com or call Sebastian on 0447 21 21 43 to get started!